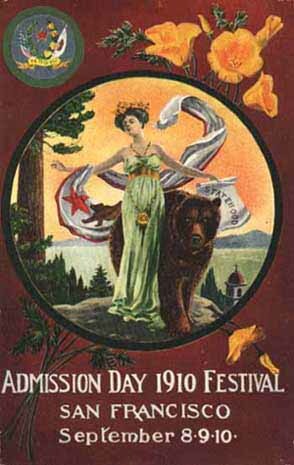 California Admission Day 1910 Festival, San Francisco September 8, 9, 10. Displayed are symbolic representations of the State of California: a Grizzly Bear, the state flag, California poppy flowers, redwood trees, a California Spanish mission, a medal stamped 1850, the Pacific Ocean and mountains. The festival was a celebration of California having become the thirty-first state to be admitted to the Union on September 9, 1850. From the collection of Lew Baer.